Bangkok (Thailand) – February 19, 2019 (travelindex.com) – Russian Standard, Russia’s Number One Premium vodka, held their grand launch in Bangkok to kick off a series of showcase events in eight cities spanning five Southeast Asian countries. The Southeast Asia tour is being organized by Brand Connect, Asia’s fastest-growing beverage distribution & brand building agency. ‘Vodka as it Should Be’, the ultimate Russian experience, was held at The House on Sathorn, a century-old national heritage site & previously home to the Russian Embassy in Thailand. Notable features of this Russian inspired evening included live culinary performances by Alexey Tyutin of Caviar House, & Chef Fatih Tutak of the House on Sathorn. Entertainment was headlined by a special performance by renowned pianist and opera singer, Mr Ivan Sharapov. The event also welcomes an honorary guest H.E. Mr. Evgeny Y. Tomikhin, the Ambassador of the Russian Federation to the Kingdom of Thailand. Tatiana Petrakova, Global Brand Ambassador for Russian Standard and originally from Saint Petersburg in Russia, represented Russian Standard at the event. She is known for having educated over 15,000 people globally on the history and technical details of Russian vodka. 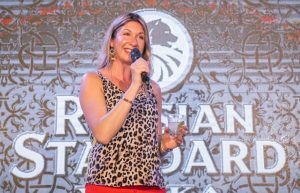 Speaking from Bangkok, Tatiana commented “We are proud to bring Russian Standard to Asia, and thank you for the incredibly warm reception we have received from the people of Thailand. We hope everyone we have met leaves with a lasting memory of a truly Russian experience celebrating Vodka as it Should Be”. “Brand Connect are committed to partnering with the world’s most progressive spirits brands. We have seen strong demand in Asia for an authentic Russian Vodka and are delighted to be bringing Russian Standard to some of the world’s most dynamic markets” said Justin Frizelle, founder and Chief Executive Officer of Brand Connect Holdings. Consistently ranked one of the fastest-growing spirits brands in the world, Russian Standard Vodka is both the number-one premium vodka in Russia and the number-one Russian vodka brand globally. Their flagship brand, Russian Standard Vodka, holds the largest share of the Russian premium vodka market and is exported to over 80 countries around the world. Russian Standard Vodka, produced only in Saint Petersburg, was inspired by the works of Russia’s most famous scientist, Dmitri Mendeleev, inventor of the Periodic Table. Mendeleev’s philosophy on equilibrium and natural order led to the identification of the perfect balance between water and alcohol, which underpinned the original Russian Empire Standard set by Tsar Alexander III in 1894. Russian Standard is a 100% authentic Russian vodka made from water of glacial origin and the finest Russian winter wheat. The ultra-clean taste of the vodka and quality liquid is the result of continued investment into technology and innovation at their state of the art distillery in Saint Petersburg. Brand Connect Group Holdings, a subsidiary of Singapore’s Duty-Free International Limited (“DFI”, SGX:5SO), was created to service one hundred percent of the distribution & brand building needs of global alcohol beverage brand owners across Southeast Asia. Founded in 2014, Brand Connect provides direct importation and brand management services in all Southeast Asian countries including Singapore, Thailand, Vietnam, Cambodia, Malaysia, Indonesia, Philippines and Myanmar.